Slightly smaller and heavier than a regulation ball, resulting in more mass and less resistance in flight for unparalleled distance. 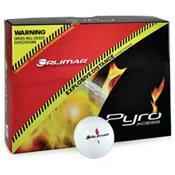 What happened to the Orlimar golf ball. No longer available. Why? The only reason these don't get a five is they're illegal for tournament play. This ball is everything most golfers could look for long, straight, cheap, and they putt well. They roll forever.